2015 Ford Edge For Sale in Vernon, Kelowna, Okanagan, BC. The 2015 Ford Edge has been redesigned around the things drivers love. It comes loaded with an all-new suspension and packed with cutting edge technology to keep you on the edge of your seat. The 2015 Ford Edge boldly rides into the future and beckons you along for the ride. It is available in SE, SEL, Sport and Titanium trim models. 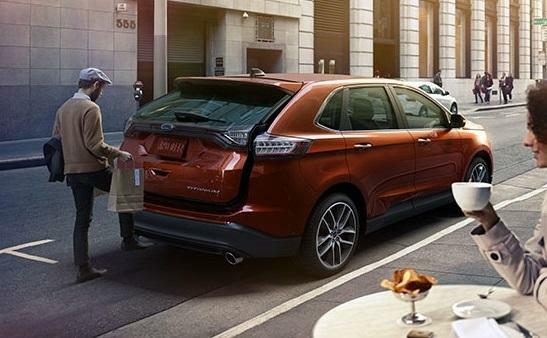 Sculpted curves and an athletic stance means the exterior of the 2015 Ford Edge is designed to help you make an entrance. 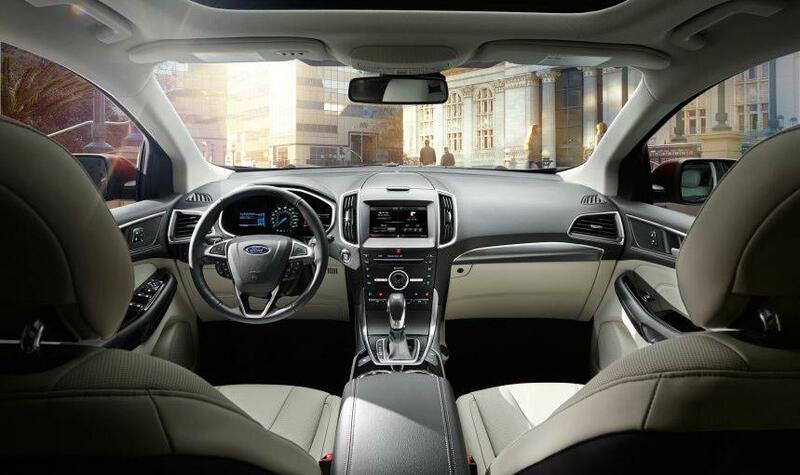 The Ford Edge is loaded with top of the line technology both inside and out. Ultrasonic sensors detect vehicles and objects in your blind spots while a 180º front facing camera tucked into the grille allows you to see around corners, down alleys and even while you’re pulling out of parking spots. The available adaptive cruise control can detect traffic slowing ahead and automatically slow the Edge. When traffic has cleared, the Edge resumes your set speed. The cutting edge technology continues on the inside with hands-free calling, voice-activated entertainment, customizable instrument cluster screens and touch-screen controls with the available SYNC with MyFord Touch in the 2015 Ford Edge. The available audio system from Sony gives you home theatre-type audio with 390 watts of continuous power through the combination of 12 speakers placed throughout the cabin. That cabin has been crafted with a thoughtful touch using luxurious materials, and was engineered to give you a quiet, secluded experience, unless you’re pounding the music through that Sony stereo, of course. The 2015 Ford Edge also features available adaptive steering, which changes the ratio between a driver’s actions at the steering wheel and how much the front wheels turn. With Ford adaptive steering, the steering ratio continually changes with vehicle speed. This optimizes steering response in all situations. At lower speeds, for example, the new system makes the vehicle more agile and easier to turn because it dials more steering into the road wheel meaning each low-speed maneuver requires less turning of the steering wheel. The 2015 Edge Sport comes with the available 2.7L V6 EcoBoost, which delivers the acceleration, horsepower and torque to keep you in the fast lane. No matter which engine you choose, it will be paired with a 6-speed automatic transmission. This year’s Edge features an all new suspension, tuned to keep the Edge’s ride as smooth as possible. 2. "Best Cars for Families" in 2007 by AAA and Parents Magazine. 4. "2007 Urban Truck of the Year" by On Wheels, Inc.
5. J.D. Power and Associates' 2007 "APEAL Award"
At press time, warranty information for the 2015 Ford Edge has not been released. When you’re looking to live on the edge or just to take a long, relaxing drive to take the edge off after a stressful day, the 2015 Ford Edge is ready to experience it with you. Its all-new features promise an exhilarating driving experience. 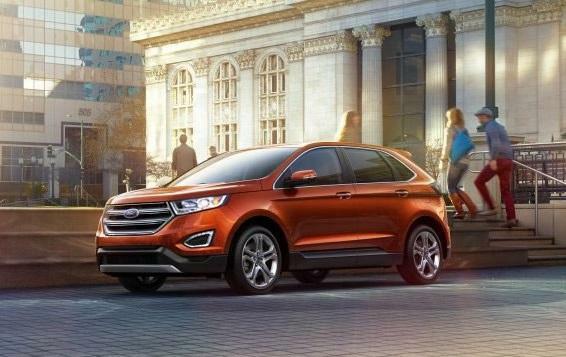 Learn more about the 2015 Ford Edge at your Okanagan Ford Dealer - Watkin Motors Ford. Watkin Motors Ford offers a wide selection of new, used and certified pre-owned models. Shop the wide selection today, and visit the showroom to find out more about the arrival of the 2015 Ford Edge.